Well y’all already know that I make an effort to supply my handsome RancherMan with his favorite Homemade Sandwich Bread, He loves it so much more than the commercial stuff and I feel good knowing that my bread is filled with only natural ingredients I recognize and can pronounce. Plus DANG, the lazy-girl er, I mean efficient side of me loves that my *KitchenAid Mixer makes it so much easier! But I find myself lately with an extra supply of oatmeal. Although I’m using it often with both hot, hearty Flavored Oatmeal as well as my own Homemade Pumpkin Granola for breakfasts, I wonder if I can amend my bread recipe to use up some of these healthy oats too. As it turns out yes I can, and with surprisingly delicious results! Other than the oat flour substitution I followed the rest of the recipe as usual. I pulled the loaves out of the oven when there was 5 minutes remaining to bake as I usually do & buttered the tops of the loaves. But this time instead I melted a small amount of a butter/honey mixture and brushed it on the tops of the loaves. Then I sprinkled raw oats lightly on top of each loaf, returning them to the oven for their last 5 minutes of baking time. My hope was that this would add a subtle sweetness while giving the oats a little something to help them hang on. I’m extremely pleased with the taste of this oatmeal version of my homemade bread. Plus it came out deliciously soft. But although the bread was delicious, my method of affixing the raw oats on top of the loaves didn’t work. Almost all of it fell off as I was cutting of the bread. So I turned to my panel of experts (aka: the Smarty-McSuperSmart followers on our Facebook Page) and asked them what they did to keep the oats on the tops of their own homemade bread. Did they use an egg white/milk wash? Maybe something else? As is typically the case, my FB friends came through for me with some great suggestions for me to try next time. So next time I bake our Sandwich Bread I’ll FOR SURE be adding the oat flour since I absolutely loved that result. And I’m sure I’ll continue to experiment with the oat flour quantity – maybe replacing some of the white flour as well next time. But you have to be careful when replacing wheat flour with oat flour. Since there’s no gluten in the oats, replacing too much hampers the rise of the bread. I’ll also give these helpful suggestions for keeping the raw oats on the tops of the loaves a try as well. How are you most successful keeping those amendments such as oats or seeds sprinkled of the tops of your own loaves in place? Oh, and just to make it easier for ya I’m adding below my sandwich bread recipe amended to include a bit of oat flour. The dough tends to be a little stickier with the oat flour addition and I ended up adding just a touch more all purpose flour at kneading to get a workable dough even though it was still somewhat sticky afterward. But the end result was delicious! Heat milk, sugar, salt & butter until butter melts and sugar dissolves. Cool to lukewarm. Dissolve yeast in warm water, pour into * KitchenAid bowl and add lukewarm milk mixture and the whole wheat & oat flour as well as 2.5 cups of the all-purpose flour. Attach dough hook and mix on Speed 2 for about one minute or until all ingredients are incorporated. Place dough in a greased bowl, turning to grease top. Cover and let rise in a warm place free from drafts until doubled in bulk, about 1 hour. Punch dough down and knead by hand on a floured surface for about two minutes. Divide in half and roll each half into a rectangle with a rolling pin. Then by hand roll each rectangle into a log, pinching the ends to seal, and place each log into a greased 9x5x2 loaf pan, turning to coat the top. Cover & let rise in warm draft-free location until doubled in size, approximately 50 minutes. Remove cover and turn oven to 400 degrees (375 for glass pan) and bake for 30 minutes. (If desired, you can use one of the suggestions in the post above to sprinkle raw oats on top of the loaf at this time). When only 5 minutes of baking time remains brush melted butter on top of each loaf and then allow to finish baking. Still a delicious bread with or without the oats on top. Like my hubby always says; “who cares what it looks like as long as it tastes good.” Don’t know about you, But I’m ready for Spring to be here. Some of our neighbors have already mowed their yards and ours actually could use a mowing job as well. Your loaves of bread look pretty. Nothing like fresh warm bread from the oven. 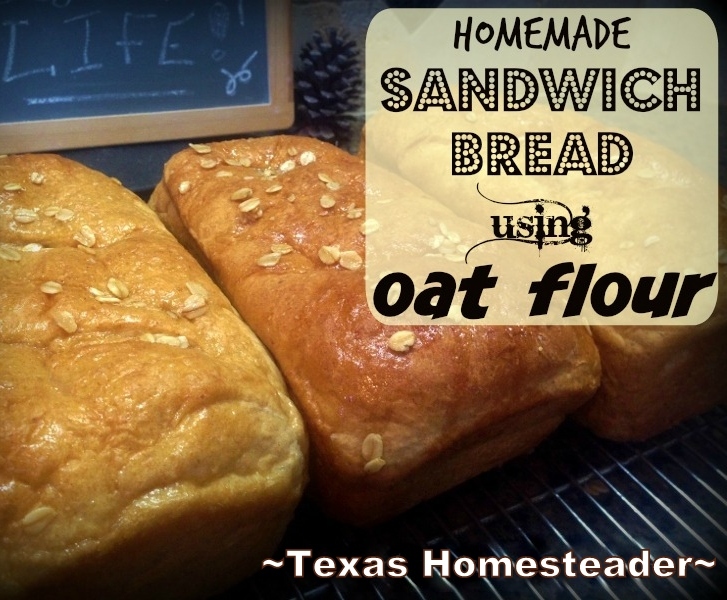 This oatmeal bread sounds healthy and delicious. I really want to try this. Thanks for finding out how to get the oats to stick to the top of the loaf. Thank you for the recipe! Thanks for sharing the tips on how to keep the oats on and for sharing on the Waste Less Wednesday Blog Hop! YUM! Thanks for linking up to #SustainableSundays! I love that your recipe uses bacon grease. We always have plenty of that around! Thanks for sharing on Simply Natural Saturdays. I’ve read both your post and the recipe, but I’m a little confused. Do you use both wheat flour and oatmeal flour along with the regular flour? Or do you use only regular flour and oatmeal flour? Also, is the regular flour just all purpose flour or do you use bread flour? Thanks, I’m sure regular bread bakers understood and I thought I did, I just wanted to make sure, since I don’t usually bake bread. I’ve wanted to, but just haven’t because of working with the yeast seem complicated. I’m going to to try yours. Thanks! Oh, wow!! This looks aaaaahmazing! I am going to try this recipe tomorrow (as I usually bake bread that day). 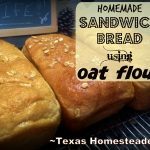 I have wanted to find a good oatmeal bread recipe, so here’s hoping it turns out as well for me as it did for you! Thanks for adding this to From The Farm…yet another favorite this week! Hope to see you again Friday! I just love homemade bread! I would like to make homemade bread every week and never have to buy the other stuff 🙂 Thanks for this recipe. It looks delicious! I can almost smell it! Thanks for sharing with the Thursday Blog Hop! This is exactly the bread recipe I’ve been searching for!! I needed to find a healthy bread that didn’t have too many pricey ingredients. Using oat flour is genius! I’ll have to give this bread a try this weekend. Thank you so much for experimenting and sharing this great recipe with us. I’ve already pinned this recipe to try within the next week or so. Looking forward to eating that grilled cheese sandwich! Thanks so much for this recipe! I had to do some baking today anyways and I came across your bread recipe – I tried it and it turned out wonderful! Not too sweet, soft, and, I’m with you here, terrific when enjoyed warm – preferably with some butter :-). I didn’t have any bacon grease, so I added some canola oil instead, plus I added a sprinkle of baking soda after the first time of rising, because I wanted a real soft bread. I tried the tip with the sugar water and put some quick cooking oats on top. Delicious! Thanks again for the great recipe! Putting the honey/oatmeal mixture on before you put your bread in the oven if gives the oatmeal a chance to bake right into the bread and will have less droppings.